The world-renowned Brass Roots Trio will be performing their operatic concert "Con Brio!" at The Lake Wales Arts Center on January 11th, 2019 at 7:00 PM. Their concert will feature the music of Copeland, Manfredini, Lobos, Piazzolla, Rossini, Verdi, and much more! BRASS ROOTS TRIO redefines the chamber music genre with the fusion of classical, jazz, Americana and Latin styles. With TRUMPET, FRENCH HORN and PIANO, (plus the bonus of a brilliant operatic tenor) the trio has won acclaim for its adventurous programming, breathtaking virtuosity and artistic passion since 2004. In 2009 Brass Roots Trio was honored to perform for President and Mrs. Obama and their guests at the White House. The founding member of Brass Roots Trio, pianist and arranger Rosetta Senkus Bacon has performed throughout North America, Europe and Asia with concerts at the Kennedy Center in Washington, Taipei Cultural Center in Taiwan, St. Moritz Cultural Center in Switzerland, and Kaunus Philharmonic Hall in Lithuania. Rosetta served on faculties and performed at The International Chamber Music Festival in Taiwan and The International School of Performing Arts in PA where she accompanied Master Classes of Metropolitan Opera stars Sherrill Milnes and Gilda Cruz-Roma. She concertized with Metropolitan Opera soprano Judith Raskin and in a lighter vein was one of the duo-pianists in “Side By Side By Sondheim” starring Arlene Francis and Hermione Gingold. A native of West Virginia, Rosetta graduated from West Virginia University and received a Master’s Degree from the Manhattan School of Music in New York. Douglas Lundeen originally trained as an opera singer with Frank Baselice of the Metropolitan Opera. Self-taught on the French horn, he won first prize for solo natural horn in the 1987 American Horn Competition. Since then Dr. Lundeen has played principal horn with period instrument orchestras in New York City, Boston, Chicago, San Francisco, Philadelphia, Vancouver and Washington, DC under such conductors as Hogwood, Norrington, Brüggen, Parrott, and Koopman. He has been a featured recitalist and master clinician at many conferences of the International Horn Society and the International Early Brass Society. Dr. Lundeen has been a featured artist/clinician in China at the Beijing Central Conservatory and the International French Horn Arts Festival in Tianjin. On the modern horn, he has soloed and played principal horn with orchestras in Costa Rica, Cincinnati, Philadelphia and Pittsburgh as well as on Broadway. Dr. Lundeen is currently Principal Horn of the Princeton Symphony and Associate Professor of Music at Rutgers University. He has recordings on the Sony, Newport Classics, Musical Heritage Society, and Centaur labels. Doug's family was adopted into a Cheyenne River Lakota (Sioux) family in 2005 and his sister Manitowah gifted him his first Native American flute. He has many friends now in the traditional Native community including on the Navajo, Blackfeet and Northern Cheyenne reservations, and learned about the Northern Cheyenne flute tradition from the award-winning artist Joseph Firecrow. 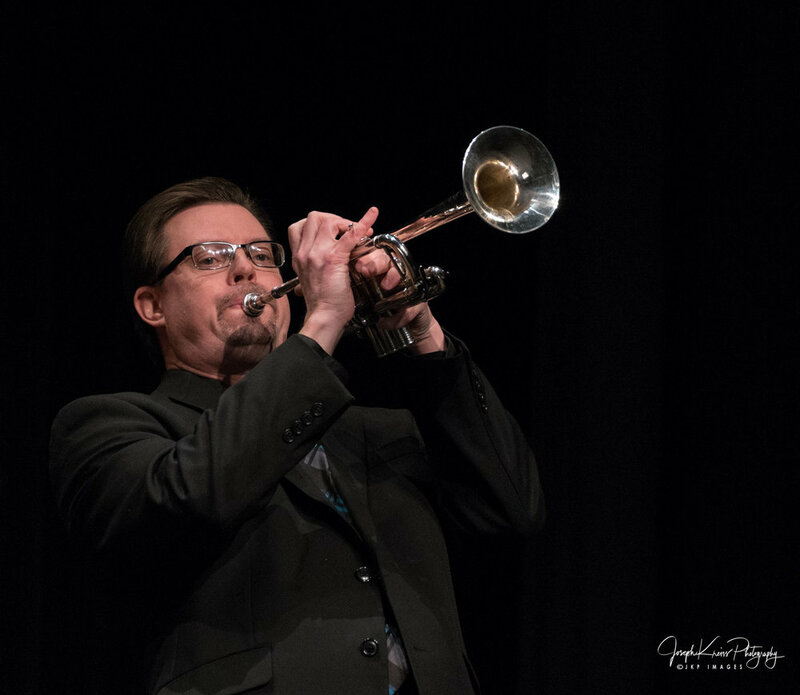 Dr. Travis Heath is Associate Professor of Trumpet at Northeastern Illinois University where he teaches Applied Lessons, Brass Methods, and conducts the Brass Ensemble. Equally at home with classical and jazz genres, Travis Heath’s international performances have included solo works, big band, and chamber music. Travis has been a soloist, featured artist and clinician in 43 states and abroad with performances on live radio, television, and webcasts. Throughout his career, Travis has had the honor of sharing the stage with musical legends including Ray Charles, Kansas, Moody Blues, Larry Combs, and Arturo Sandoval, to name a few. Outside of the US, Dr. Heath has performed in Japan, England, Ireland, France, Italy, The Czech Republic and Canada at prestigious musical festivals. His performances can also be heard on the Naxos, BRT, and Mark recording labels. As a brass clinician, he has presented his work at several universities throughout the country and at ITG Festivals. Dr. Heath’s articles have been published in the Instrumentalist Magazines and ITG Journal. He currently resides in Chicago, IL and is director and founder of the Chicago Brass Festival. Travis received a Bachelor of Music Degree at the University of Central Florida and a Masters and DMA at Rutgers University.